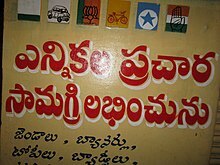 According to the famous Japanese Historian Noboru Karashima who served as the President of the Epigraphical Society of India in 1985, calculated that there are approximately 10,000 inscriptions which exist in the Telugu language as of the year 1996 making it one of the most densely inscribed languages. Telugu inscriptions are found in all the districts of Andhra Pradesh and Telangana. 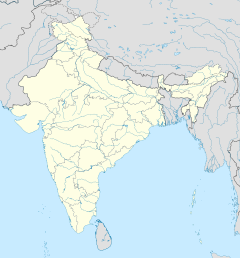 They are also found in Karnataka, Tamil Nadu, Orissa, and Chhattisgarh. According to recent estimates by ASI (Archaeological Survey of India) the number of inscriptions in Telugu language goes up to 14,000. Namely Adilabad, Nizamabad, Hyderabad, Anantapur, and Chittoor — produced no more than a handful of Telugu inscriptions in the Kakatiya era spanning between 1175–1324 CE. 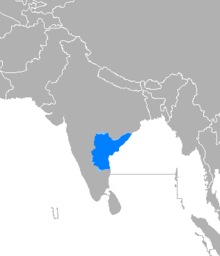 In Karnataka the dialect sees more influence of Kannada and is a bit different than what is spoken in Andhra region. 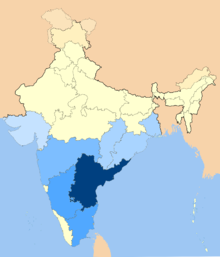 There are significant populations of Telugu speakers in the eastern districts of Karnataka viz. Bangalore Urban, Bellary, Chikballapur and Kolar. ^ "Telugu gets classical status". Times of India. 1 October 2008. Archived from the original on 2008-11-04. Retrieved 1 November 2008. ^ "PART A Languages specified in the Eighth Schedule (Scheduled Languages)". Archived from the original on 2013-10-29. ^ Sheldon Pollock (2006-05-23). The Language of the Gods in the World of Men. p. 421. ISBN 9780520245006. ^ Richard Salomon (1998-12-10). Indian Epigraphy: A Guide to the Study of Inscriptions in Sanskrit, Prakrit, and Other Indo-European Languages. p. 100. ISBN 9780195356663. ^ Talbot, Cynthia (2001-09-20). Precolonial India in Practice: Society, Region, and Identity in Medieval Andhra. ISBN 9780198031239. ^ Albert Henry Arden (1873). A progressive grammar of the Telugu language. Society for promoting Christian knowledge. p. 57. Retrieved 2014-08-03. ^ Charles Philip Brown (1857). A grammar of the Telugu language (2 ed.). Christian Knowledge Society's Press. p. 39. Retrieved 2014-08-03.